August 2010. Dharma combat with Enkyo Roshi during the Village Zendo's summer ango at Cornwall-on-Hudson, NY. Dharma combat's the most fun you can have at a Zen temple. 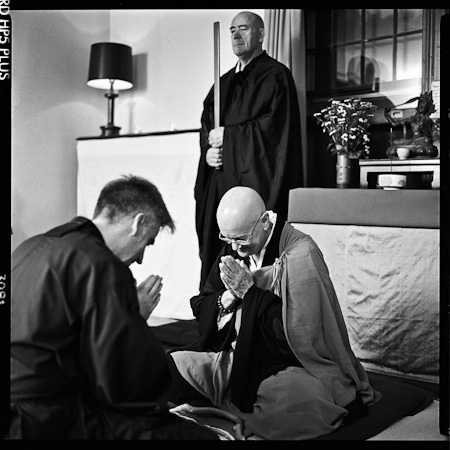 A senior Zen student or a teacher—in this case my teacher, Enkyo Roshi—sits at the front of the room and takes on questions from all comers. She answers instantly, speaking from her direct experience, rather than reciting dogma or playing mind games. The ritual simulates a competition, but of course it isn't really. The teacher and the questioner demonstrate Zen together. Both of them jump free of all the religious show business and uncover their real selves for everyone.